Shoestring 9/11: Was Korean Airlines Flight 85 a Simulated Hijack in a 9/11 Training Exercise? This explanation would make sense of the pilots' otherwise inexplicable actions. And there is additional evidence supporting this possibility: On September 11, NORAD--the military organization responsible for defending North American airspace--was in the second week of a major exercise. Five days earlier, that exercise included two scenarios with remarkable similarities to the apparent crisis involving KAL 85. In one scenario, members of a fictitious terrorist group hijacked a Korean Airlines 747 bound from Seoul to Anchorage; in the other, a 747 bound from Japan to Anchorage was hijacked, and changed course for Canada. We know that the U.S. and Canadian military were in fact conducting several exercises on the morning of September 11. Those exercises were supposedly canceled promptly in response to the attacks. But if KAL 85 was a simulated hijacking, it would mean at least one exercise continued well into the afternoon, hours after the attacks took place. This would raise serious questions: When exactly did the military exercises really end that day? If they were called off promptly, as has been claimed, how many people were aware of this? Did some believe the exercises were continuing in spite of the real-world attacks? And was there a sinister but as-yet-uninvestigated relationship between the real-world attacks and the military exercises they coincided with? The first indication of a possible hijacking was at 11:08 a.m., while KAL 85 was flying across the Pacific Ocean and hundreds of miles from mainland Alaska. The pilots sent a text message to Korean Airlines headquarters, which included the letters "HJK." These three letters were a known code for signaling a hijacking. The message did not immediately raise any concerns. However, ARINC--a company that airlines pay to transmit text messages to and from their planes--had begun scanning all the communications it transmitted that day to search for any additional hijacked aircraft, and one of its technicians came across the message, apparently shortly before noon. Concerned that it was a coded plea for help, ARINC officials notified the FAA of the message. KAL 85 showed its next indications of being hijacked after it entered the airspace of the FAA's Anchorage Center at around 1:00 p.m. An Anchorage Center air traffic controller, aware of the concerns about KAL 85, asked the pilots about the status of their aircraft. In his radio transmissions, the controller included the code word that indicated a query as to whether the plane had been hijacked, in case the pilots were unable to acknowledge this freely. (Pilots are trained how to respond to such coded messages.) However, the pilots of KAL 85 offered no reassurance that their flight had not been hijacked. Instead, at 1:24 p.m., they switched their plane's transponder (a device that sends information about an aircraft to controllers' radar screens) to "7500," which is the universal code meaning a plane has been hijacked. As USA Today put it, "Suddenly ... a routine flight became a potential new attacker." And yet KAL 85 was never hijacked. The FAA's Command Center in Herndon, Virginia, was in contact with Korean Airlines headquarters, which emphatically maintained it had received no indication that the flight was in trouble. Might the "indicators of a hijacking situation" therefore have been because KAL 85 was playing a hijacked aircraft in a training exercise? KAL 85 continued being treated as a potential threat even after it landed at Whitehorse. After touching down, the plane was directed to a secluded area on the tarmac. It was surrounded by heavily armed RCMP emergency response officers. After an officer asked to speak with a member of the flight crew, the co-pilot emerged and was escorted off the plane at gunpoint. According to a local resident who saw the incident, the co-pilot had his hands up and "had everyone drawing down on him, and he had to take some clothes off, wave his shirt in the air and all that." The passengers were not allowed off the plane until more than two hours after it landed. One thing that is suspicious is the way Korean Airlines and the government agencies involved with these incidents were subsequently reluctant to explain why KAL 85 had given indications of being hijacked, or they gave conflicting explanations. Could this have been because these organizations needed to cover up the fact that--despite the attacks earlier on in New York and Washington--a hijacking simulation was still being carried out on the afternoon of 9/11, in which KAL 85 played the hijacked aircraft? The military reportedly blamed the false alert on "muddled communications between air traffic controllers and the flight crew aboard the plane." But Korean Airlines claimed that the pilot of KAL 85 "believed he was directed by air traffic controllers at the FAA's Anchorage flight control center to send out the hijack signal." The airline's administrator, Michael Lim, said: "Our captain was following their instruction. [The Anchorage Center] even told the captain to transmit code 7500, hijack code. Our captain, who realized how serious it is, they were just following instructions." WAS KAL 85 PART OF AN EXERCISE SIMULATION? This secrecy and confusion would certainly make sense if these agencies were trying to cover-up KAL 85's involvement in a training exercise. What makes this possibility seem even more likely is that, five days before 9/11, NORAD practiced two exercise scenarios with an uncanny resemblance to the apparent crisis involving KAL 85. Those scenarios were part of its annual exercise, "Vigilant Guardian," which was still taking place on September 11. 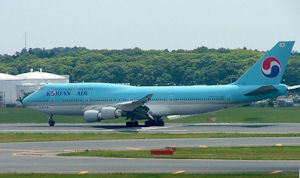 In the other exercise scenario on September 6, a Boeing 747, also bound for Anchorage, was hijacked by terrorists, although in that case the plane had taken off from Tokyo, not Seoul. A fictitious terrorist group called "Mum Hykro" was threatening to "rain terror from the skies onto a major U.S. city unless the U.S. declares withdrawal from Asian conflict." Some of the plane's passengers were killed. The plane changed its course to Vancouver, Canada, and then to San Francisco, California. The military was directed to respond, by providing "covert shadowing" of the hijacked aircraft, presumably by fighter jets. NORAD had to liaise with the appropriate air traffic control center. Its Alaskan region and Canadian region participated in the scenario. Again, we see similarities to the events involving KAL 85 five days later. Might the apparent hijacking of KAL 85 on 9/11 have therefore been a simulation intended as a follow-up to these two previous scenarios? Clearly, the actions of KAL 85 and the plane's possible involvement in a military exercise require more investigation. But the fact that exercises resembling the real-world attacks were taking place on September 11, and--if my conclusions about KAL 85 are correct--at least one of those exercises was still going on hours after the attacks in New York and Washington took place, should be of concern to us all. Alan Levin, "Korean Air Jet May Have Narrowly Missed Disaster." USA Today, August 12, 2002; Patty Davis, "Korean Jet in 9/11 'Hijack' Scare." CNN, August 14, 2002; Lynn Spencer, Touching History: The Untold Story of the Drama That Unfolded in the Skies Over America on 9/11. New York: Free Press, 2008, pp. 256-257. Alaska Legislature Joint Senate and House Armed Services Committee, Presentations by Lieutenant General Norton Schwartz and Major General Willie Nance Jr. 22nd Leg., 2nd Sess., February 5, 2002; Zaz Hollander, "High Alert." Anchorage Daily News, September 8, 2002. Alan Levin, "Korean Air Jet May Have Narrowly Missed Disaster"; Zaz Hollander, "High Alert"; Lynn Spencer, Touching History, pp. 278-279. Alan Levin, "Korean Air Jet May Have Narrowly Missed Disaster"; Patty Davis, "Korean Jet in 9/11 'Hijack' Scare"; Zaz Hollander, "High Alert"; Lynn Spencer, Touching History, pp. 257, 277-278. Lynn Spencer, Touching History, p. 278. Alan Levin, "Korean Air Jet May Have Narrowly Missed Disaster." Zaz Hollander, "High Alert"; Lynn Spencer, Touching History, p. 257. "Stranded Passengers Flood Canadian Airports." CBC News, September 12, 2001; Zaz Hollander, "False Sept. 11 Hijack Signal Put Air Force on Alert." Anchorage Daily News, September 29, 2001; Alaska Legislature Joint Senate and House Armed Services Committee, Presentations by Lieutenant General Norton Schwartz and Major General Willie Nance Jr.; Zaz Hollander, "High Alert." Alaska Legislature Joint Senate and House Armed Services Committee, Presentations by Lieutenant General Norton Schwartz and Major General Willie Nance Jr.
 Shawn McCarthy, "PM Says U.S. Attitude Helped Fuel Sept. 11." Globe and Mail, September 12, 2002; Sheldon Alberts, "PM Links Attacks to 'Arrogant' West." National Post, September 12, 2002. Alan Levin, "Korean Air Jet May Have Narrowly Missed Disaster"; Patty Davis, "Korean Jet in 9/11 'Hijack' Scare." September 11, 2001, Whitehorse International Airport Emergency, pp. 14-15. "Korean Passenger Jet Diverted to Whitehorse Treated as Hijacking: RCMP." Canadian Press, September 12, 2001; "Korean Planes Make Emergency Landings." United Press International, September 12, 2001; Zaz Hollander, "False Sept. 11 Hijack Signal Put Air Force on Alert." September 11, 2001, Whitehorse International Airport Emergency, pp. 17-18. "Korean Passenger Jet Diverted to Whitehorse Treated as Hijacking: RCMP." Lynn Spencer, Touching History, p. 279. Zaz Hollander, "False Sept. 11 Hijack Signal Put Air Force on Alert." September 11, 2001, Whitehorse International Airport Emergency, p. 5. Thanks for this excellent article. This is the first time I've seen the info and I appreciate it being well referenced. Yet again, another absurd "coincidence" of "exercises" overlapping "real-world" attacks. The only reason the "exercises" remain shrouded by national security is because they fail to work as plausible deniability. It's like a banks security guard turns out to be living with the guy who just robbed it. The vault schematics are posted on the newly refurnished living room wall. Walkie talkies with both the guard and robbers fingerprints are there tuned to the same channel. When asked about these "coincidences" the security guard says" "SHUT UP! THAT INFORMATION WOULD COMPROMISE BANK SECURITY! Shame on you for thinking I could be involved! I was SECRETLY drilling for just such a robbery because I'm a genius and could have prevented it if you trusted me more!" The banks customers cower and say "Yes Sir." The guard is made head of security and he makes sure every woman and child is strip searched before they come in. I was in the Yukon on 9/11. I remember feeling grateful for being so far away from what was going on, until I heard on the radio about the evacuations in Whitehorse. I also lived in Korea for three years, recently, teaching English. This whole business was, without doubt, the pilots' inability to understand the instructions given to them by English-speaking ATC. Hey Shoestring, interesting article. Although your conclusions are debatable, the legwork/summary of facts around KAL 085 is impressing, as usual. You probably know that one year after your article, Canadian filmmaker Max Fraser published some primary data about KAL 085, like ATC recordings, flight data, and transcripts. The link was https://web.archive.org/web/20111117015907/http://maxfraser.ca/?page_id=20. The website is long gone since then, as are the documents (even in the internet archive). Do you have a copy, especially of the transcript of the communication between FAA Anchorage ARTCC and KAL 085? I asked Max himself, but he apparently didn´t find it in his archives. Although I have seen Max Fraser's documentary, I do not have copies of the documents he used to have on his website, unfortunately. I don't know where you might find them, but keep looking!